In the course of writing my next book, Chimborazo, I discovered something that I’d never noticed before – that Ecuadorians are so proud of their highest mountain that they’ve put it on their national flag. This fact got me thinking: is Ecuador the only country with a mountain on its flag? After squinting for half an hour at a database of world flags (that’s the kind of interesting life I lead) I discovered that the answer to this question is a resounding ‘no’. In fact, there appear to be no fewer than seven countries whose flags have mountains on them (perhaps there are more, but I can only squint so much). To spare you from ruining your eyesight by squinting at the flags yourselves (and thus allowing some of you to spend more time on other pursuits which are believed to impair your vision), here they are. Ecuador gained its independence in 1822, after General Antonio José de Sucre defeated Spanish forces at the Battle of Pichincha. 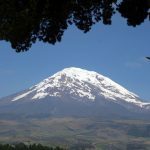 The volcano Pichincha is the first mountain many visitors to Ecuador see after getting off the plane in Quito, but it’s another mountain, 6,310m Chimborazo, that first appeared on Ecuador’s flag when the crest was added in 1900. The flag has special significance to me personally. In addition to Chimborazo, the crest depicts a steamboat floating up the Guayas River in Guayaquil. 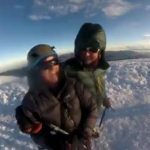 It was from here that Edita and I began our Chimborazo sea-to-summit challenge last year. We were following in the footsteps of Edward Whymper, who took a steamboat himself from Guayaquil to Babahoyo before making the first ascent of Chimborazo. 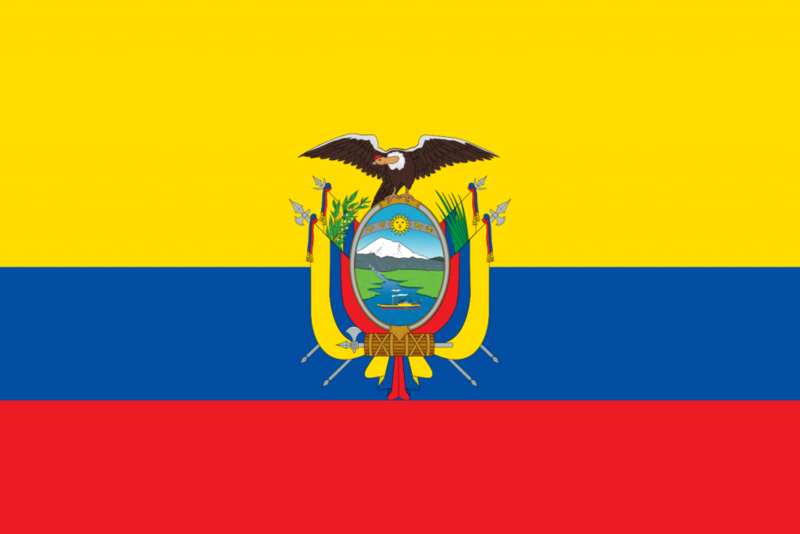 Ecuador’s is one of the world’s fussier national flags. The flag also features a condor stretching its wings to “symbolize the power, greatness and strength of Ecuador” (I love Ecuador, but this assertion may cause some people to wonder why the condor isn’t shitting like a bull). If you look carefully you will also notice that the crest features four more national flags hanging up. None of these flags contain the crest itself, which means a golden opportunity was missed to have an endless chain of Chimborazos disappearing to infinity. 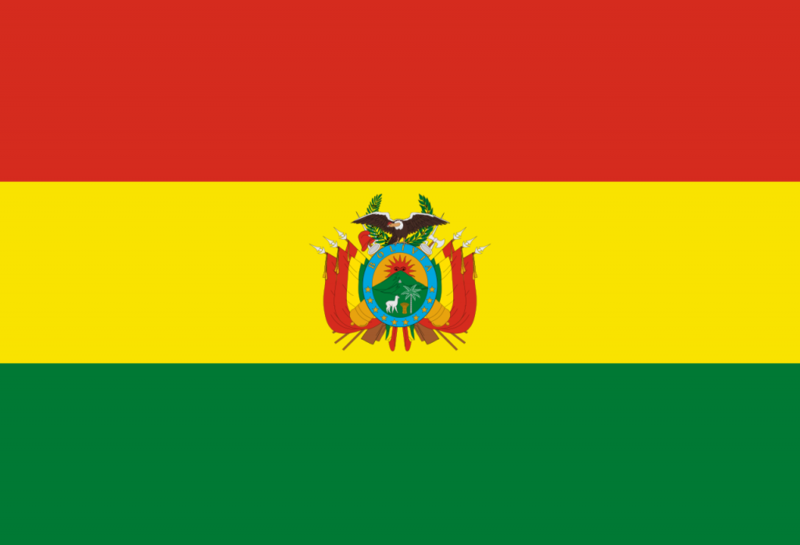 With its red, yellow and green tricolor, the national flag of Bolivia could be mistaken for the flags of Lithuania, Ethiopia and Ghana but for its fussy old crest in the middle. In fact, the crest and the tricolor cause Bolivia’s flag to look suspiciously like Ecuador’s, not least because the exact same condor symbolising power, greatness and strength appears to have flown the length of Peru to perch on another mountaintop in Bolivia. In addition to the condor, an alpaca stands next to a palm tree, gazing up at the rising sun. The mountain in question is Cerro Rico. The significance of this otherwise innocuous 4,782m lump of brown rock is twofold. In 1825, after liberating the region around La Paz from the Spanish, Simon Bolívar climbed to the top of the mountain then known Cerro Potosí and planted the flag of independence for the new country that now bore his name. Then there is the fact that the mountain which later came to be known as Cerro Rico provided an estimated 60% of all the world’s silver in the 16th and 17th centuries. By 1996, it was estimated to have produced 60,000 tonnes of the stuff, which, if nothing else, must once have made it one of the world’s heaviest mountains. Cerro Rico continues to be mined to this day. It was also known as the “mountain that eats men”, due to the number of people who have died mining it. Give me Chimborazo any day. Costa Rica must have one of the most geographically explicit flags in the world. The coat of arms in its centre depicts a narrow country separated by two great seas (the Pacific Ocean and Caribbean Sea). This land contains three mountains, representing Costa Rica’s three main mountain ranges (the Cordillera de Tilarán, Cordillera Central and Cordillera de Talamanca). You might think these details would be accurate enough for most people, but not for the Costa Ricans. In 1998, they decided to add little puffy clouds to the tops of the three mountains to turn them into volcanoes. Costa Rica contains 14 volcanoes, six of which have been active recently. Now that’s what I call letting off steam. El Salvador adopted its flag in 1912. 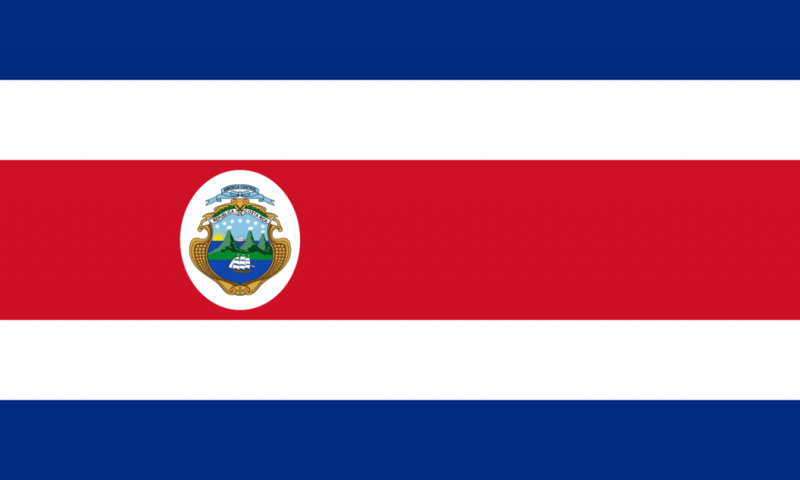 Like Costa Rica, it has a coat of arms depicting volcanoes. In El Salvador’s case, these are five green, forested volcanoes, inspired by the five main peaks of the Cordillera de Apaneca range in the west of the country, whose five peaks are Santa Ana (the highest at 2,381m), Cerro Verde, Izalco, and the two summits of San Marcelino. 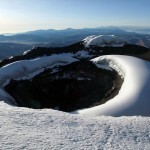 2,381m might not sound like much, but Volcan Santa Ana has four active craters, and it last erupted as recently as 2005. And anyway, it’s not the smallest mountain to appear on a national flag, but more on that later. I’m coming to the conclusion that Central Americans aren’t the most imaginative. Just up the road from El Salvador is Nicaragua, and as you can see, their flag is almost the same. At just 61km2, San Marino is the world’s fifth-smallest country and is entirely surrounded by Italy. Paradoxically, it owes its existence to its support for the Italian unification process that took place in the 19th century. It was a place of refuge for people persecuted for supporting unification. In recognition of this, the Italian general Giuseppe Garibaldi, who succeeded in unifying Italy in 1861, accepted the wish of San Marino not to be incorporated into the new state. The refuge was lowly Monte Titano (739m), the highest mountain in San Marino, whose three summits contain the Three Towers of San Marino: Guaita, Cesta and Montale, the earliest of which date from the 11th century. It’s an appropriate mountain to put on a national flag. 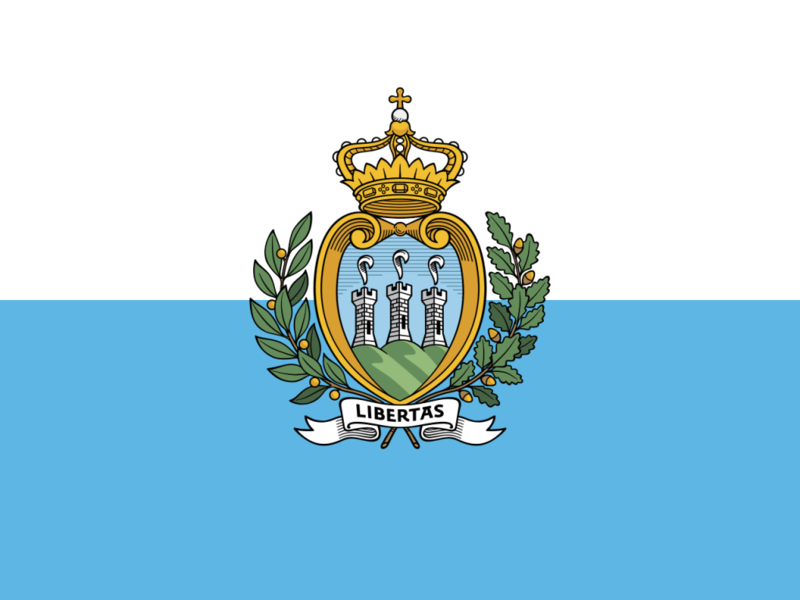 San Marino’s next most famous monument is its grand prix circuit, and heaven help us if they decide to put that on the flag. Slovenians love mountains. I once tried to climb Cho Oyu in Tibet with a group of four Slovenians. I was told that one of them, Miha, was a well-known Slovenian television personality. They left a deep impression on all of us, and I have an abiding memory of shaking Miha by the hand when it was time to go our separate ways. ‘When I get home, I’m going to look up Slovenia on a map,’ I said. The dark look he gave me suggested that this wasn’t the right thing to say (on the plus side, at least I didn’t say ‘Slovakia’). 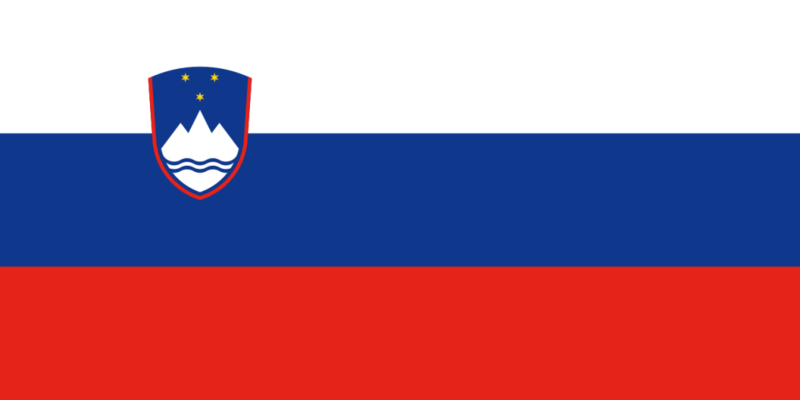 In fact, Slovenia has produced many great mountaineers, including Tomaž Humar, Tomo Česen and Marko Prezelj. A Slovenian team recently made headlines by successfully completing the first ascent of the north ridge of Latok I (7,145m) in Pakistan, a route that had resisted all attempts for 40 years. Many people have told me to visit the Julian Alps, and one day I hope to go there. The crowning glory is Triglav (2,864m), the highest mountain in Slovenia. It’s a fitting symbol to put on the flag of a nation of mountain lovers. Your comment to the Slovenian tv personality was the funniest thing I heard all day! I love it. Oh, and the flag/history lesson was also quite interesting. Thanks Mark. OK, it’s not a country, but the Malaysian state of Sabah has a nice representation of Kinabalu on its flag! Two aspects to my comment: Thankyou for your deconstruction of the ‘twaddle’ by “Jumped Jeffrey of Archer’s” somewhat daft ignorance re mountaineering where from the west one can see the east with an amazing Jefrey Archer mirror. As a retired, keen part-time amateur climber of mountains in the Antipodes, I enjoyed the gentle ridicule of the “famous lord.” His book is for milksop couch loungers: Secondly, I am not able to you show any flags or Coates-of-Arms with mountains because ours is the Prussian eagle: but I have connections to “Croix de Lorraine”.